The public meeting hosted on Friday by the Lawyers’ Forum for Democracy and Justice on the ‘Independence of Judiciary- Implications for Democracy’ witnessed some strong remarks from eminent members of the legal community. The event, held at the Indian Society of International Law in New Delhi, saw in attendance inter alia senior counsel Indira Jaising, former ASG Biswajit Bhattacharya, celebrated advocates KK Manan, Vrinda Grover and Indira Unninayar, former ADJ Sangeeta Madan, journalist Maneesh Chibber, and former National Judicial Academy director G Mohan Gopal. The issues for discussion were- independence of the judiciary; appointment of judges; reform of the roster system; and mechanism for redressal of complaints against judges. “The judicial system is turning into a hereditary institution...the network that one has determines their elevation to judgeship...Children of judges succeed them as judges...,” she remarked. “Sadly, the main criteria for appointment as a judge is 10 years’ experience as an advocate...many advocates are much more experienced...why are they not elevated as judges then...,” she continued. “I congratulate the four Supreme Court judges (Justice J Chelameswar, Justice Ranjan Gogoi, Justice Madan B Lokur and Justice Kurian Joseph) who, in the press conference called by them on January 12, acted as whistle-blowers regarding the threats to democracy..., they are my heroes ” said Ms. Jaising. 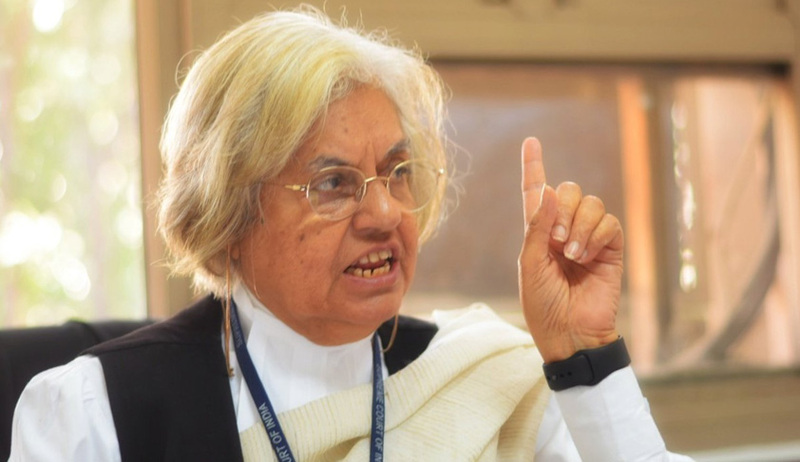 Ms. Jaising has drawn attention to the dilution of the stringency of the Scheduled Castes and Scheduled Tribes (Prevention of Atrocities) Act of 1989 by “two judges” and the lack of any judges from the said categories in the Supreme Court. She also expressed her doubts regarding the appointment of Supreme Court Justice Ranjan Gogoi as the next CJI. “When four seniormost judges of the Supreme Court, including the next incumbent Chief Justice of India, make a statement that they are discharging the debt of obligation to the nation so that the posterity does not allege that they sold their souls, it is to be understood as the biggest threat to democracy,” he said. She discussed the mechanism for redressal of complaints against members of the higher judiciary, in the light of her complaint of sexual harassment against Justice SK Gangele. “When in context of the independence of judiciary it is said that the judges shall not meet, it means that they shall meet their own...this network continues and it is this network that creates a discourse of justice...,” she continued. Ms. Grover expressed her concerns regarding the March 13 interim order of the SC extending indefinitely the deadline for Aadhaar linkage, except in respect of section 7 of the Aadhaar Act of 2016 mandating the procurement of Aadhaar for access to social security schemes. She also remarked that the trial in the Ishrat Jahan fake encounter is proceeding in the same manner as that in the Sohrabuddin murder and that she shall continue to stand for and represent Ms. Shamima Kauser, the mother of Ishrat Jahan. Ms. Unninayar discussed the significance of the ability of the judges to operate uninfluenced by extraneous considerations, in the light of “stray comments like one gets relief depending upon who argues for them and whether the advocate has the ear of the judge”. “The lack of judicial independence may be attributed to the appointment system itself, the manner of adjudication and the absence of any accountability...”, she elaborated. “In 60-70% of the cases, in which the government is a party, and the judge adjudicating the matter is also from the government, there cannot be even a remote sense of justice...this is why it is necessary that, in addition to appeals, there must be a consequence of contempt or complaint against such judges...there is a provision in the Contempt of Courts Act in respect of a judge who obstructs the administration of justice, but it has been greatly diluted...”, she continued. “An example would be of the experience we recently had at the Delhi High Court...the son of a fellow judge was arguing before a bench that is usually very impatient...but very compassionately they told the advocate that he had no case...even when he failed to produce any satisfactory response, they facilitated the argument, heard him for 20 minutes and then issued notice...the very next matter was ours regarding contempt against certain police and municipality officials for corruption...the bench dismissed it within 2 minutes without even hearing us...”, she advanced. “I am not criticising the collegium system only today...I have said earlier as well that the Collegium system permits only a handful of privileged individuals, who are related to judges, to become future judges...much like the film industry where the legacy was passed on from Prithviraj Kapoor to Raj Kapoor, thereupon by Raj Kapoor to his sons, and so on...There are many competent lawyers who will never get elevated to judgeship for the same reason...”, began Mr. Manan. “It can be proved that ninety percent of the members of the subordinate judiciary are corrupt”, he exclaimed. “If the judge Loya case produces no results, then no individual in the world may be face prosecution...,” he commented. “The independence of the judiciary is the child whose mother is democracy...The January 12 press conference has delivered the apocalyptic message that the judiciary is in danger and the four senior most judges of the Supreme Court are helpless...it was an appeal to the citizens of the nation...it may be compared to The Last Supper...”, he remarked. “Lord Devlin had said, in context of the UK, that if a dictator ever rose to power, he would, firstly, shut down the Parliament, which is not something we need to worry about in India because the Parliament is already shut down, and secondly, he would shut down the jury system because it is the lamp that shows that freedom lives”, advanced Prof. Gopal. In respect of the rise to power of a dictator, he had commented that it is no longer a hypothetical situation in India. “The independence of the judiciary is compromised when former Chief Justices are appointed as Governors...it is also compromised when judges are assigned jobs post their retirement...Just like when former Chief Election Commissioner MS Gill had become a minister in the UPA government, I had believed that the independence of the Election Commission went out of the window...I had even written an article on a former Chief Justice of India who went on to become the NHRC chairman and thereupon, a governor...,” said the journalist. “Would it be moral if the government chooses to interrupt Justice Gogoi’s appointment as the next CJI on technical grounds...for some unimportant, unfounded allegation...,” inquired Mr. Chibber rhetorically. He also questioned the stalling by the Centre of the elevation of Uttarakhand High Court Chief Justice KM Joseph, who had quashed the President’s Rule in the state in 2016, and senior counsel Indu Malhotra as Supreme Court judges, adding that he is not affiliated with either the BJP or the Congress. The attempt of the four senior-most judges of the apex court in alerting the nation to the dangers of an arbitrary assignment of cases to “benches of preference” was appreciated. The House called upon the President of India to issue warrant of appointment of all judges recommended by the Supreme Court Collegium, including Uttarakhand Chief Justice KM Joseph and Ms. Indu Malhotra. The House also supported the call of the judges in the Karnan case for a mechanism for redressal of complaints against members of higher judiciary short of impeachment.